Strategically located opposite VivoCity, the largest shopping mall in Singapore, Bay Hotel Singapore offers stylish non-smoking rooms with free WiFi and free well-stocked minibar. 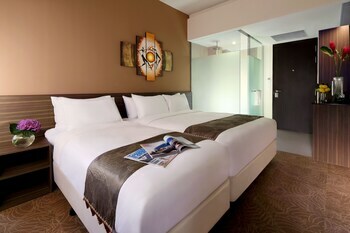 Make yourself at home in one of the 333 air-conditioned rooms featuring refrigerators and LCD televisions. Complimentary wireless Internet access keeps you connected, and cable programming is available for your entertainment. Private bathrooms have rainfall showerheads and complimentary toiletries. Conveniences include safes and complimentary newspapers, as well as phones with free local calls. With a stay at Bay Hotel Singapore in Singapore (Bukit Merah), you'll be minutes from VivoCity and close to Universal Studios Singapore®. 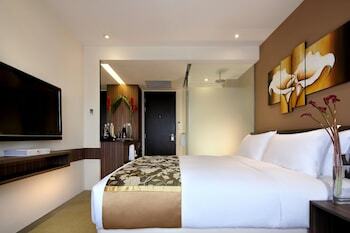 This 4-star hotel is within close proximity of Singapore Cruise Centre and HarbourFront Centre. The preferred airport for Bay Hotel Singapore is Singapore (SIN-Changi). Distances are displayed to the nearest 0.1 km and mile.